On a bit of a brighter note, I am quite pleased to announce a money saving offer from Ramada Kingman, the city’s only full service Route 66 resort. For a 10% discount on rooms as well as Kingman area promotional packages, simply use the code JIMHINCKLEY when making a call in reservation. I hope that this serves as added incentive to visit Kingman, and to discover the world of wonder in our neighborhood. As an example, one of the Ramada Packages includes free tickets for a Grand canyon Caverns tour, which would require a drive of sixty scenic miles along Route 66.
broadens its reach and scope (after months of trial and error), there will be similar offers from other businesses, and marketing opportunities for businesses as well as for communities and event organizers. Expanding the scope (podcasts, video blogs, presentations, etc.) of Jim Hinckley’s America, a long pursued goal, is made possible by sponsors and advertisers. This week, I am pleased to announce the addition of My Marketing Designs, Save On Bath Treats, and Simply Prepaid from T-Mobil, the Kingman store, as sponsors. Now, I would like to share a few thoughts on communities that get it, those that don’t, and those that are starting to. This train of thought started with a brief tour of the Kingman historic district to showcase all of the recent developments followed by a very good dinner at the Dambar, and some stimulating conversation punctuated with a few laughs shared with Jessica and Nancy Mueller, one half of the family that provides the Blue Swallow Motel with such infectious vibrancy. One topic of our conversation that was rather timely for me pertained to communities that steadfastly wait for their ship to come in while sitting in a train depot. In these tragic places opportunity flows into town on a daily basis but it never is moved from the docks. Even worse, resources are squandered on developing ways to profit from association with the railroad even though the rail line ends on the outskirts of town. 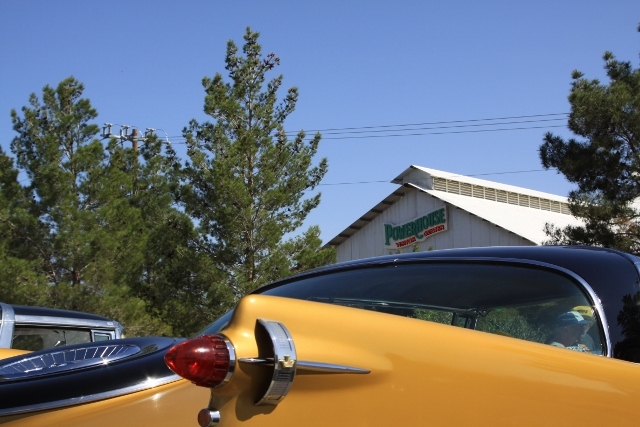 As noted previously, communities located on Route 66, especially in the southwest, have at their fingertips almost unlimited marketing and promotional opportunities. As a bonus, by applying resources to development that makes the town a destination for tourists, the tourists will in turn magnify promotional initiatives rather dramatically. 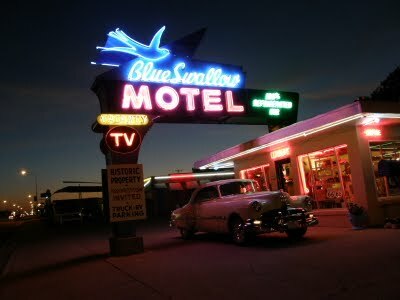 Surprisingly, a number of communities along the highway corridor see little or no value in developing Route 66 related marketing, or even giving the endless stream of Route 66 travelers a reason to do more than fill their car with gas or grab a bag of burgers on their way out of town. This is a bit extreme but here is an example of chasing nickels while dollars blow down the street. I recently attended a marketing meeting in Williams, Arizona on behalf of a client. The business owner that had called the meeting was looking to create a pooled resource marketing initiative. Did I mention that this gentleman owned a business on Route 66, in WILLIAMS, ARIZONA? Incredibly, I have encountered similar attitudes at the city level when addressing chambers of commerce, city councils, and even tourism offices. The concept of pooled resource marketing is an idea that has intrigued me for quite some time, especially in regards to the possibilities it represents for Route 66 communities or business owners. I am currently following the progress of Kingman Circle, a similar concept but with a narrower focus. What, may I ask, are your thoughts about a similar initiative developed for the Route 66 community?